On Abarrach, Xar is attempting to learn the secret of necromancy, but he needs a corpse to test it on. He interrogates the lazar Kleitus about the location of any living Sartan, and Kleitus reveals that Haplo lied to Xar about all the Sartan dying at the hands of the dead; Balthazar and his group remain living. Kleitus drops a hint about the Seventh Gate, and reveals that it's where the Sundering took place and that Haplo's corpse would know its location. Xar dismisses this idea, as well as the lazar, and is quickly becoming obsessed with the Seventh Gate when receives word that two Sartan have been captured: Zifnab, for one, whose pleas on Haplo's behalf go unheeded; and, as quite a prize, Samah, ruler of the Council of Seven. Xar is initially excited since Samah is the very person who would know the Seventh Gate's location, and he interrogates Samah for it to no avail. Sang-drax— the one who actually captured Samah and Zifnab— is summoned by Xar to mentally torture Samah to death; even before he dies, Samah does not reveal anything useful. Xar succeeds in turning him into a far-more-complacent lazar, but too much of Samah's will remains, and he still won't talk. Even worse, when Xar turns his back to investigate Zifnab's disappearance, Jonathan walks in and teaches Samah how to let go; the leader of the Council of Seven is now well and truly dead. Xar is soon told by Sang-drax of Haplo's "treachery"; he has helped the mensch start the Kicksey-winsey and given control of Arianus over to the mensch, instead of reserving it for Xar himself. Party to this conversation is the loyal servant who informed Xar of the capture and has already been ordered to investigate the Arianus situation: Marit, the woman Haplo loved, the mother of his child. Xar marries her in traditional Patryn fashion of rune-joining, both to ensure her loyalty and because it gives them an unblockable way to communicate, and then orders her to kill Haplo. Haplo rests on Arianus and tries to heal his heart-rune, a job that truly needs two people (most rune-healing is accomplished by "circling" and allowing strength from one person to flow to the other.) Prince Rees'ahn and King Stephen's deputy, the wizard Trian, have come to Drevlin to talk with High Froman Limbeck Bolttightener in the hopes of hammering out some sort of true alliance between all three races of mensch (the mysteriarchs having folded into the human race after their leader Sinistrad's death.) Haplo gives the Kenkari book to Limbeck, and the three races together reactivate the Kicksey-winsey, which realigns the scattered islands of Arianus and starts a constant flow of water through the sky. Then Haplo enters his dragonship and prepares to leave for the last time. Hugh, under contract to kill Haplo, retraces his own steps. He goes from the Cathedral of the Albedo back to the Fortress of the Brotherhood, where Ciang gives him a cursed knife: ugly, badly made, capable of self-movement... and covered in Sartan runes. It is the only weapon the Brotherhood has that might even possibly be capable of killing Haplo. As payment for it, Ciang orders him to never return or further payment will be taken in his blood. Hugh, in the end, doesn't even use his new Cursed Blade— its main advantage, suppressing Haplo's warning runes and a good amount of his magic, allows Hugh to sneak up on him in his ship and capture him, but the tables turn and Hugh accidentally ends up with Haplo's knife in his gut... only to lurch back from the grave, Alfred's necromancy rune having evidently condemned him to eternal life. Haplo circles with Hugh to calm the human's distress at returning from the dead yet again, and the two begin to plan how to find Alfred when they are interrupted. Marit appears and fights both Haplo and Hugh. The first time they engage their Patryn rune-magic, however, the Cursed Blade reacts, transmuting itself into various threats, and the three break off their conflict periodically to quiet it down (they can't really make it stop;) they also struggle over the ship's steering-stone. Eventually Haplo takes the ship to Chelestra, hoping to douse the Cursed Blade in seawater, but the knife, instead of transforming into another weapon or creature, summons a dragon-snake that destroys the ship. As Haplo drifts in the sea, he hears a voice and looks up to see... Alfred. At Sang-drax's misleading suggestion, Xar has gone to Pryan with the pretext of taming the tytans, and he is frustrated with his inability to reach Marit. His real reason for being there is his hope of finding the Seventh Gate in the citadel that Haplo visited, but he finds little to encourage him. The five mensch— Paithan, Rega, Aleatha, Roland, and Drugar— aren't much help, nor is Zifnab, who has somehow gotten here after escaping from Abarrach. Shortly after Xar and Zifnab have arrived, Sang-drax says he knows now that Zifnab is "one of them;" after a battle with Zifnab's dragon, he takes on Xar's form and steals the ship, claiming that he will search for Haplo while Xar is on Pryan. It is revealed during Xar's stay that Zifnab is actually one of the dissenting Sartan who refused to go along with Samah's plan; he was among the mensch on Earth during the Sundering, and was the first of either race to escape the Labyrinth. It was he who penned many of the books Xar educated himself with. (With all that Zifnab has seen, his total dementia seems a bit more understandable.) Xar decides to leave Pryan in a ship he spotted outside the citadel, covered in Sartan runes, but to do that he needs to get past the tytans. He decides to need to kill off the mensch and revive them with necromancy to serve as distractions. The mensch are having their own problems. Paithan is obsessed with a room in the center of the citadel that he calls the Star Chamber, a room with seven huge seats and an apparatus that generates blinding light. Roland and Aleatha are mostly not on speaking terms; the elf maiden finds herself spending more time with Drugar, who may be the last of his race. But Drugar has discovered a delightful illusion: at a certain clearing in the garden maze, at certain times of the day, he can see ghostly shadows of people from all the mensch races, walking around and talking to each other. Aleatha is there when he uses his amulet to activate the platform, teleporting him instantly to a different citadel— where, as it turns out, there are other survivors. Marit finds herself in a Sartan prison. On a bench in the middle of the room, Haplo recovers from injuries caused by the Cursed Blade. Across from it, Hugh the Hand and the dog watch her with unblinking eyes. Their "jailer": none other than Alfred, who rescued them from Chelestra. After some discussion, Haplo realizes that they are in the Vortex, the one-way gate at the very center of the Labyrinth. It was here that the Patryns were initially imprisoned and chose to live for generations, until people calling themselves Nexus runners started trying to escape. (It's unknown when they abandoned the Vortex and all moved out into the Labyrinth.) Haplo decides to enter the Labyrinth in search of his daughter, whom Marit named Rue. Hugh agrees to go with him, as does Marit at Xar's command; he has told Marit to hold off on killing Haplo to report back any conversations Alfred and Haplo have about the other worlds. It is only Alfred who balks. He has nothing left— Orla "saw" Samah's death and chose a peaceful death to be with him— but fear of the unknown. The Labyrinth itself, however, refuses to let him return to the Vortex by unceremoniously dropping a mountain on top of the exit back into it. To Haplo, the Labyrinth seems afraid of Alfred, though he can't for the life of him figure out why; what is Alfred, besides a bumbling, useless Sartan? ... Who can turn into dragons? And bring people back from the dead? The group is about to be overrun by tiger-men when, surprisingly, a Patryn raiding party comes to save them. This party comes from Abri, the one and only city inside the Labyrinth (anathema to the lone-wolf Patryns). While camping overnight, Alfred admits his true name to Haplo: Coren, a Sartan word that can mean "chosen" or perhaps "to choose." Many Sartan children were named that, in hopes of a self-fulfilling prophecy, but (as Haplo points out) Alfred did not feel particularly amused when he awoke, the last living Sartan on Arianus. Clearly Alfred was Coren, was chosen—but for what? Marit, however, betrays them by revealing that Alfred is a Sartan. Haplo, Hugh, and Alfred are jailed by the city's leader, Headman Vasu, to await Lord Xar— Marit accused Haplo of being a traitor and plotting against their people— but are freed again just as quickly after Marit overhears the disguised Sang-drax plotting to kill them. 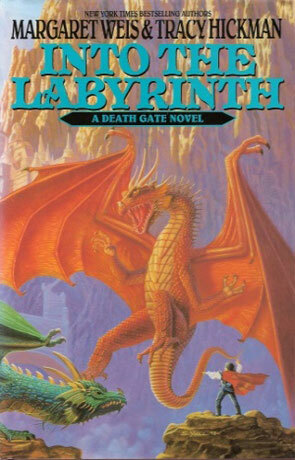 Sang-drax and his cronies are also gathering a huge army of the Labyrinth's native monsters, with which to destroy the city of Abri and seal the Final Gate; they allowed Marit to overhear them to feed off the emotions that would come from it. Abri's occupants prepare for its defense, while Haplo and Marit, prodded by the dog, finally find their love for each other. Alfred feels out of place; though few seem to begrudge him his Sartan heritage, he is still out-of-place here, a clumsy pacifist in a city preparing for war. Talking with Headman Vasu, however, he eventually discovers that the city was not made by Patryns (who do not build cities,) or at least not by Patryns alone— the Sartan "heretics" who were expelled into the Labyrinth were accepted by the Patryns, eventually integrating completely into the society; Vasu himself is half-and-half, supplementing his Patryn tattoos with Sartan magic. The Patryns taught them the value of family; the Sartan, in return, taught the Patryns the value of banding together. Here, at the heart of the Labyrinth, rises Abri, the city that symbolizes the best in both cultures. Alfred also finds out why he is called the Serpent Mage: it is a title from a Sartan hierarchy of strength in magic, whose levels are named after animals. Serpent is very near the top. Alfred has found the meaning of his name: to choose his power, and all the responsibility it comes with... Or to choose Alfred, who would rather faint than have to use his magic. Back on Pryan, Drugar returns from the other citadel with knowledge: he knows how to stop the tytans. Aleatha has fled the maze, though; pushed into hysterics by his sudden (and literal) disappearance, she ran back to her brother, and the four are now at a "party" of Xar's, at which he hopes to kill them with poisoned wine so that their bodies will be undamaged. Zifnab, however, saves them by drinking all of it himself and saying that it was poisoned, faking his death once again. The mensch are horrified at the revelation that Xar means to kill them. Aleatha escapes the room, while the other three are sealed inside by Xar... until Zifnab's dragon discovers Zifnab's "death" and tears the room apart. Aleatha has fled once again into the maze, where Xar can't pursue her because of protective Sartan runes covering its path. She runs into Drugar and he tells her they have to let the tytans inside to help them; he shares with her how to stop them. They run for the gates, but before they can reach it, Xar attacks; Drugar sacrifices himself to save Aleatha. Xar is about to kill Aleatha when the dragon strikes, distracting Xar with battling it instead of killing mensch. The other mensch have escape from the destroyed room and find her, and they think she's mad when she tells them what she's going to do. She uses the amulet to open the gate and invites the tytans inside; they peacefully enter and ask, —Where is the citadel? to which Aleatha answers, "Here is the Citadel. You are home." Xar recovers from his battle with the dragon, and prepares to leave for the Labyrinth after Marit reports back to him— apparently corrupted by Haplo's influence into thinking Xar has made a mistake in allying with the dragon-snakes, as she says they are planning an attack. He is surprised when the tytans don't kill the mensch, and actually act to protect the mensch from him, but he avoids a fight by snatching Drugar's amulet from Aleatha and running away with it. The amulet will gain him entry into the Sartan ship, which he can then use to return to the Labyrinth. At Abri, the battle between Patryns and Labyrinth creatures rages fiercely, but the real threat comes from the dragon-snakes. Haplo, Marit, and Hugh lead a sortie to deal with them, and the three battle Sang-drax in his serpent form. Sang-drax is apparently killed by Haplo, but Haplo has been badly injured and almost crushed beneath the massive body. Marit is attacked by a wolfen when a green and golden dragon carries it away: Alfred, having made his choice to accept his power. He lifts the serpent's body off of Haplo, leaving Marit to hold his blood-soaked form, his heart-rune's wound having reopened. But while Alfred is distracted in battle with the dragon-snakes, Xar appears. He wants Haplo's knowledge of the Chamber of the Damned, and will stop at nothing to get it. The battle ends with the Labyrinth's armies driven off, but Marit dazed and wounded, Haplo abducted by Xar, and Alfred missing in action. Written on 12th September 2008 by Ant.